I've come to rely on afternoon snack breaks. Because I frequently work from home, I use my snack-time as a chance to evaluate my day's progress and to take a mental time-out. I often walk or bike to Stumptown or Heart Roasters and sometimes, when I have more energy, I bake a treat. 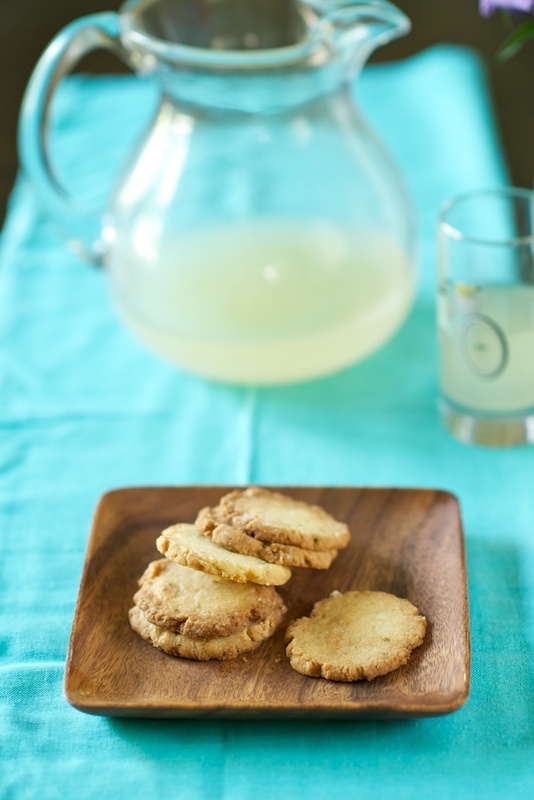 Last week, to commemorate the first official day of summer (a date that didn't correspond with the upper 50 degree weather outside), I made thyme lemonade and lemon-lime basil shortbread cookies. 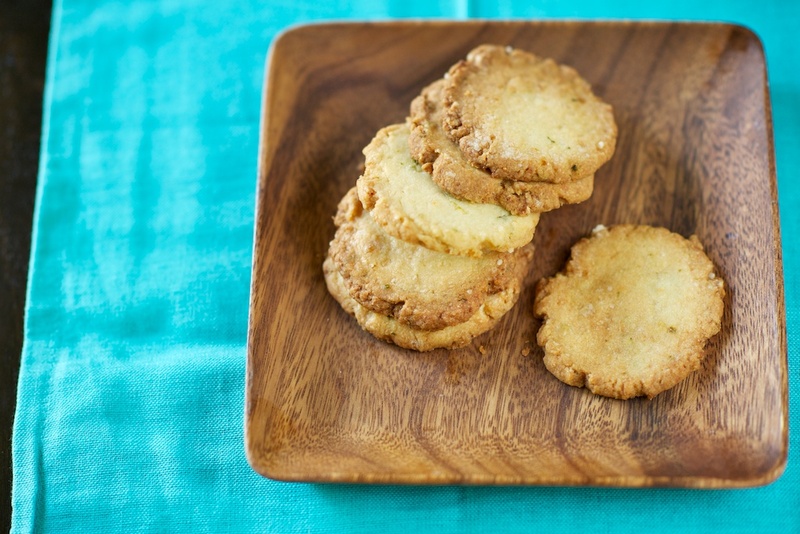 The cookies were pleasingly snappy, with just a hint of savory at the end of each bite. 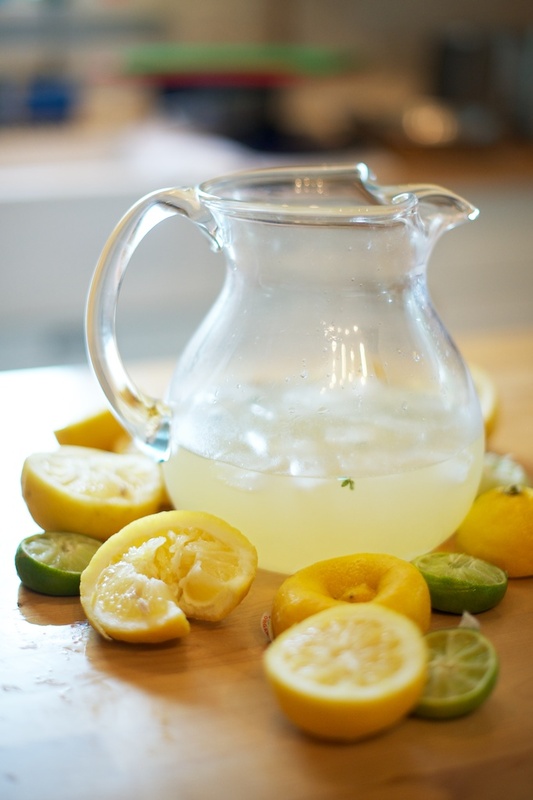 And the homemade lemonade, glistening in its pitcher, can be served strong or diluted, depending on how much ice you use. The bright flavors (and minimal clean-up) sent me back to the computer, reinvigorated to start another batch of photo-editing. 1) Preheat the oven to 375. 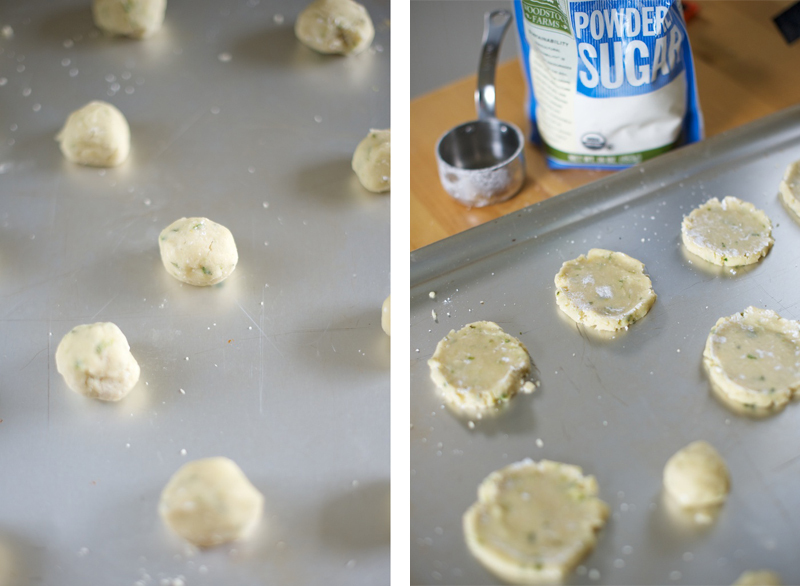 In a food processor, add the flour, powdered sugar, butter, basil, both zests, lemon juice, and salt. 2) Pulse until large, moist clumps form (30-45 seconds). 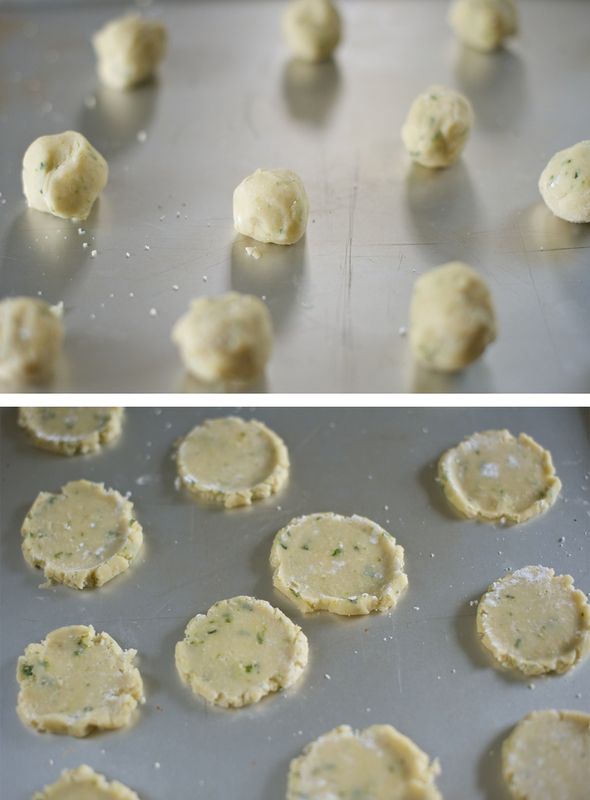 Remove tablespoons of dough from the food processor and form small balls. 3) Space the balls 2 inches apart on a baking sheet. Lightly dust the bottom of a measuring cup (1 cup or 3/4 cup works well here) with powdered sugar and press the cookies down into 2 inch rounds. 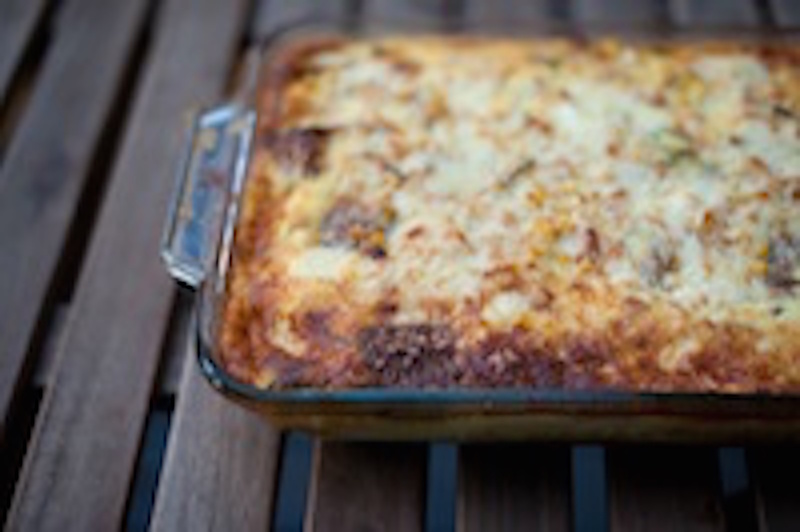 4) Bake until edges are brown, 20 minutes-but watch the oven carefully. Let cool on a wire rack. 1) Make the simple syrup by combining the sugar and 1/2 cup of water in a saucepan. Bring to a boil, stirring occasionally, until the sugar is dissolved. Let cool. 2) In a large bowl, combine the syrup with 1 cup lemon juice and 3 cups water. Stir. 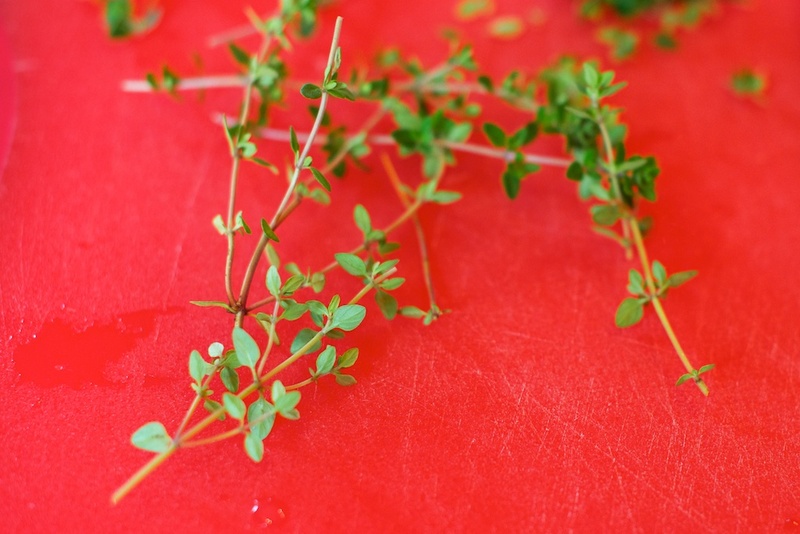 3) In a pitcher, mash the thyme with the lime juice. Add the lemonade and refrigerate for at least an hour. 4) Serve over plenty of ice!